After much anticipation, year three of the Nina Brekelmans Running Camp for Girls is off to a great start. Our team has been looking forward to welcoming this group of girls to camp, and week 1 did not disappoint. We were inspired by the energy and enthusiasm of our nearly 30 campers. This year, we were joined by Nina’s dear friend and sister in Jordan, Hanoia Ali, to help inspire and lead our group. 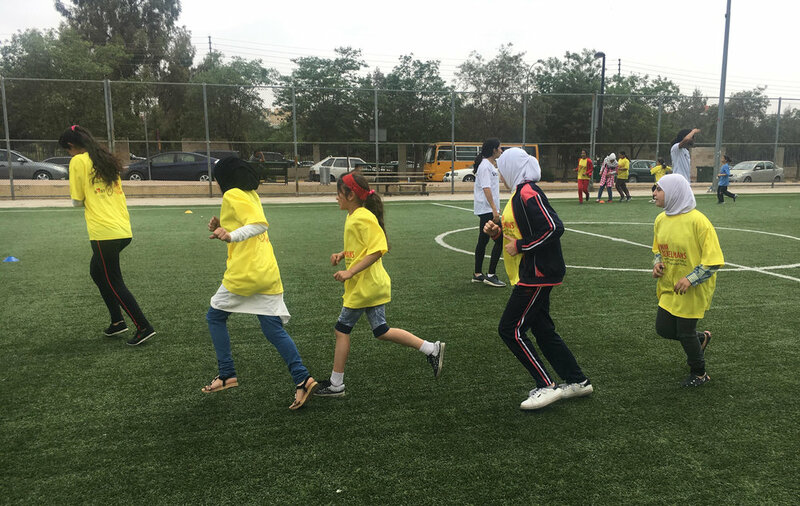 Similarly, we’re grateful for our continued partnership with Reclaim Childhood (RC), a nonprofit that empowers refugee women and girls through sport. 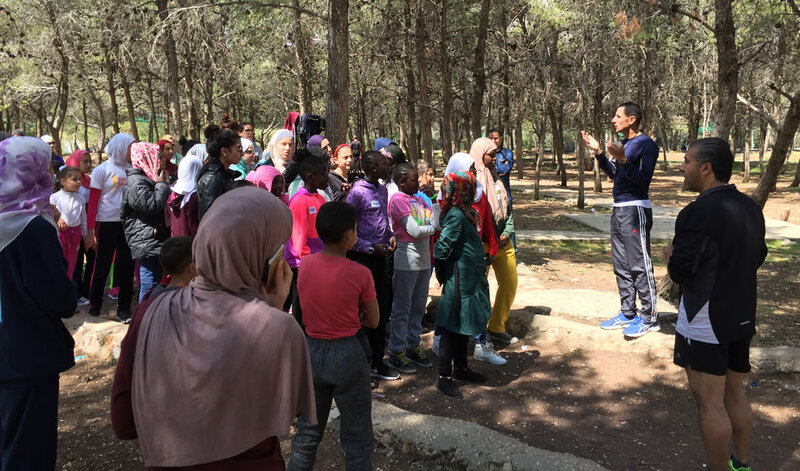 With coaching from Hanoia, RC leaders Hanan and Ru'a, and nearly 15 volunteers, we were energized by the spirit of the camp. As a special twist, this year a group of older girls who’ve participated as campers in the past registered to support the camp as volunteers. We’re really excited to see this mentorship blossom. A big focus of this year’s camp is creating a community of mentorship, whereby girls ages 15 and 16 have an opportunity to lead and support younger campers. Camp started with an introduction to Nina's story, her legacy, and her passion for the Jordanian running community. Campers and volunteers were then invited to introduce themselves, and our coaches led the girls in a quick icebreaker game to encourage community-building. In this game, girls would run into the circle, name an activity they had never tried before, and then a fellow camper could run into the circle if she had tried the activity. The runners had a blast and enjoyed hearing each other’s stories. Then it was time to run! The group warmed up with some short sprints, stretching, and easy running. Coaches and volunteers encouraged the girls to do their best and cheered them on. Seeing coaches and volunteers positioned at the end of the run, the girls were even inspired to sprint to the finish line! After our warmups and training, the girls headed to a shaded area to sit down, enjoy a snack, and relax. During this time the participants were introduced to a ‘race visualization’ activity they’ll do every week of the camp leading up to the competition. Each participant was given a notebook with coloring pencils, which they used to write three goals for themselves and draw a picture of themselves crossing the finish line. This activity reinforced the importance of setting goals and instilled in the girls the importance of reflection. Camp ended with an inspirational talk by Hanoia, who discussed the importance of exercise and values of staying active. Hanoi inspired the girls to overcome obstacles and continue to work hard. This is a lesson we hope will resonate with campers through the coming weeks as we prepare for the big race. After a great start, we can’t wait to see what next week brings! We began the final week of camp a full hour ahead of schedule as the eager girls and their coaches excitedly showed clapping and cheering on the buses at 9:00 am. Some girls ran around the soccer field before camp warm-ups, while others challenged each other to rolling races across the field. We officially started the day with Coach Rawda leading the girls in a series of team building activities and games. The girls warmed up with a fun "elimination" racing game. Coach Rawda laid out cones across the field before signaling for the girls to sprint between cones. She would then steal a few, sending those who could not easily find a cone out for the remainder of the round. Eventually we crowned our winner! After that, Coach Rawda began sprint drills by ages. The top three girls in each round were given a big high five and acknowledged for being the fastest in their group. Next up came long distance running warm-ups, while the girls practiced running around the field several times. Midway through the morning of camp, we were joined by a photographer from Qasid Institute for Arabic Studies, where Nina had studied for several months while on the CASA program. The photographer, Huda, took several lovely photos of the girls before we began our long run. We hope to share these photos later this month! This long-distance run was designed to prepare the girls for the race, and was led by Sophie and Coach Rawda. Both accompanied groups of girls on the run while taking several breaks to ensure that all of the girls were able to run at their own pace. Some girls took a break by picking flowers and giving them to each other, Coach Rawda, and Sophie. The younger girls in the back of the line encouraged each other on the path of success When the girls arrived back at the soccer field, they took a water break, and then played a couple more games led by Sophie and Amanda. Sophie led the girls in a Zumba activity and a group dance, where the girls shouted in Arabic “1 - 2 - 3 - ZUMBA!” while Amanda led the girls in a fun tongue-twister exercise that left all of the girls giggling. After much silly fun was had, the girls were ready for lunch. They ate sandwiches, apples, and bananas under the shade of some big umbrella tents and were able to hang out and take a well-deserved 20 minute break. After the girls enjoyed their delicious lunches, they were able to participate in the the final activity. They returned to the soccer field where Rawda gave a final lecture about the importance of good sportsmanship. Each girl was given the journal back that they had been using to write in since the first day, and the campers logged their final thoughts about how they were going to prepare for the race in the coming days and reflected on what they had learned throughout camp. As camp was coming to a rapid close after a jam-packed day of activity, the girls signed their names to our two participation posters, which will be hung up at the race, and were presented with certificates of completion of this year’s camp organizers. Coaches, volunteers, and girls are very excited for the race this upcoming Saturday, May 5th 2018!